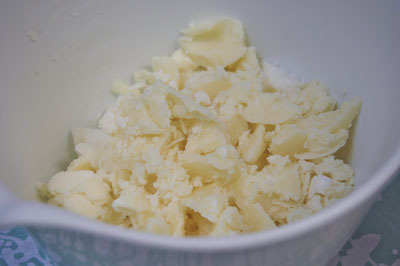 How to make soap using the room temperature method. You've probably read about how to make soap using the cold process method and have heard many soap makers referring to the room temperature method. Now I'll bet you're wondering what the difference is between these two methods? Simply put, you don't heat any oils and you don't check temperatures using the room temperature method. For quite some time I stuck to my guns and refused to even attempt something so absurd sounding! Yeah, I know.....that's a pig headed, narrow minded, know-it-all way of thinking. I hear you and heartily agree! Learning how to make soap for most of us is an adventure. And what sort of adventure would it be if we didn't try something new once in a while? After I got off my high horse and gave it a go, I fell in love. This is now my favourite method by far!! What could be better than being able to make beautiful soaps without having to use any heat source? How about no long waits for the oils and lye to cool...or worse, cold water or ice baths to bring down temperatures. And no thermometers! It's fast, easy, efficient and in my opinion, much more fun. These basic instructions on how to make soap using the room temperature method assume you have read about sodium hydroxide safety, know about the supplies and oils needed, are familiar with the cold process method of soap making and in general, have done your research. Prepare your soap mould and measure out the additives such as scent, colour, botanical matter or any soap bits you may be using and set them all aside. 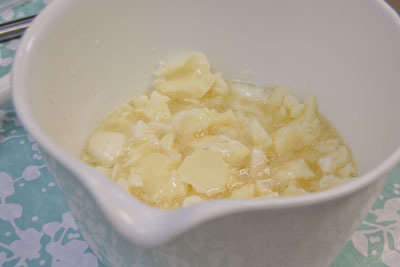 Weigh out and place all hard oils (butters, coconut oil, palm oil, tallow, lard, etc.) into your soaping container. Weigh out the liquid oils and set them aside as well. Prepare your lye solution by first weighing out the water and then the sodium hydroxide. Slowly pour the sodium hydroxide into the water and gently stir until the crystals dissolve. 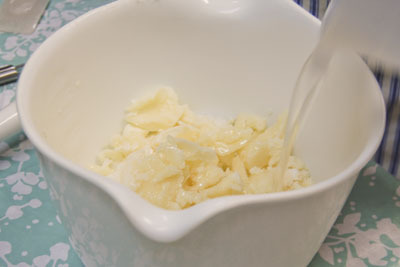 Once the lye solution has become clear, you can slowly pour it over the hard oils in your soap pot. 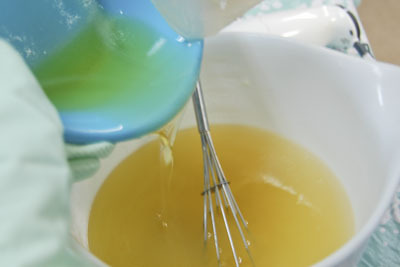 The lye solution will be very hot and that heat is what will melt your hard oils. 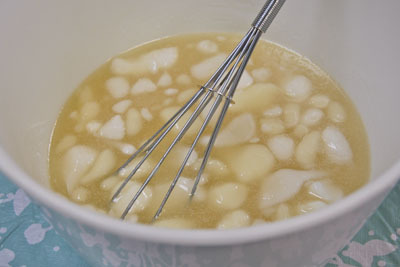 Gently mash the hard oils down into the lye solution with your whisk and slowly stir until the hard oils have completely melted. It may take awhile but be patient and keep stirring gently. 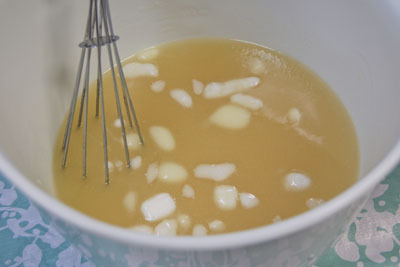 Add the liquid oils to the soap pot and whisk together. 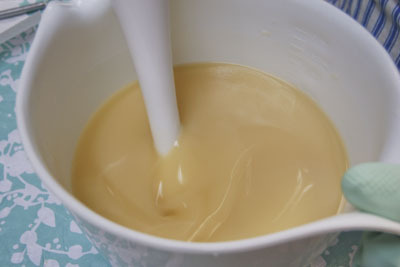 Using your stick blender, mix the soap batter in short bursts alternating with hand stirring until the soap reaches a thin trace. You can now add your scent, colour and other additives. 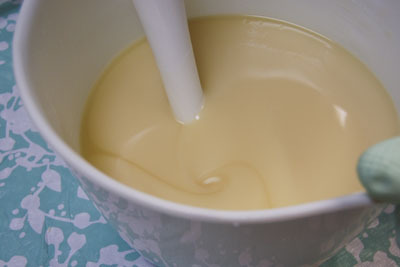 Blend and pour into your soap mould. Cover the soap, wrap and insulate until the soap sets. As soon as the soap has cooled to the touch and is firm enough to handle, you can cut it into bars. The soap will then need to cure for 4 to 6 weeks.